Chuck faced a similar situation! In ‘Chuck Versus the Santa Suit’ it’s Christmas at the Buy More. Chuck’s sister Ellie is in full Christmas mode, meanwhile the Omen virus has infected computers worldwide. The virus causes holiday shoppers to panic and things get a little out of control. 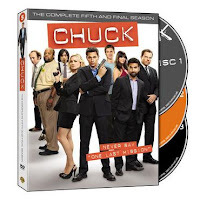 If you are a fan of Chuck, make sure to check out this clip from the entire cast of Chuck extending their sincerest gratitude and thanks to all their fans! Also, make sure to head over and buy Chuck: The Complete Fifth Season on DVD here: http://bit.ly/HCQtVe. And save yourself some MONEY by using Promo Code: c5wbwrd for 20% off + free shipping from wbshop! Have you had a similar holiday experience like Chuck where things went awry? Where the crowds as nutty as they were at the Buy More?